$60.00 Badge of the Tile of Merit (aka Medal of Honored Functionary of Mongolian People's Republic), #0043. Early version with engraved number on the reverse and lighter shade of blue in the state emblem. Excellent condition. $50.00 Badge of the Title of Merit (Medal of Honored Functionary of Mongolian People's Republic. Unnumbered version, circa 1980s through early 1990s issue. In excellent condition. 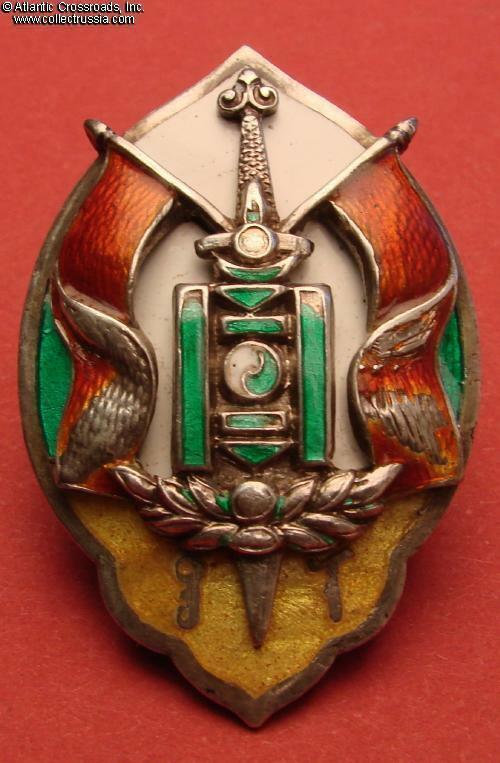 $950.00 Badge of an Honored Employee of Mongolian State Security, #943, circa 1940s-50s. Magnificent badge in hallmarked sterling silver and high quality enamels. In outstanding condition. $750.00 50th Anniversary of the Special Departments of Mongolian State Security, award badge, 1972. In excellent condition. Extremely rare. $45.00 Badge Commemorating the 60th Anniversary of Mongolian State Security. An attractive award in near mint condition. $15.00 60th Anniversary of Mongolian State Security, 1982. Awareded exclusively to State Security officers. $40.00 Honored Border Guard, 1960s issue. Excellent condition. $120.00 Honored Border Guard Badge, circa 1970s-80s. Excellent quality piece obviously produced by the Soviet Mint. A fairly scarce award in near mint condition. $175.00 Excellent Border Guard badge, Type 1, #886, 1930s-40s. Very scarce badge in fair to good condition. Includes original screw plate. $55.00 Excellent Border Guard badge, circa 1960s-70s. Excellent condition. $35.00 For Success in Guarding the State Border, 3rd cl., 1970s-80s. Very fine to excellent condition. $25.00 Commander of Border Guard Patrol badge. Excellent condition. $20.00 40th Anniversary of Mongolian Border Guard Troops, 1970s. $35.00 50th Anniversary of Mongolian Border Guard Troops, commemorative award badge, 1984. In outstanding condition. This relatively uncommon badge is not shown in A. Battushig's book. $20.00 50th Anniversary of Border Guard and Interior State Security Forces, 1984. Excellent condition. $25.00 50th Anniversary of the Choibalsan Border Guard Regiment, 1985. Excellent condition. $45.00 Police Auxiliary Breast Badge, circa 1950s-60s. This version of the badge is larger and of nicer quality than others. In excellent condition. $45.00 Badge for 60th Anniversary of Mongolian Police, 1981. Brass, enamel paint. $80.00 Choibalsan Sharpshooter Badge, 1940s-60s issue. A very attractive Mongolian sniper's award in brass and enamels. A premium example in excellent condition (its only flaw is slightly reduced screw post) with original screw plate maker marked "Moscow Artists Cooperative". $25.00 Badge for Excellence in the Armed Forces, brass, enamel paint. $40.00 Badge for 40th Anniversary of Victory at Khalkin-Gol, 1979 issue. $20.00 50th Anniversary of Mongolian People's Army, commemorative award badge, 1971. In very fine condition. $15.00 Badge Commemorating the 60th Anniversary of Mongolian People's Army, circa 1981. In excellent condition. $125.00 Mongolian Military Defense Society (BKhKhN), Badge for Contribution to National Defense, circa 1940s-50s. The exact purpose of this early organization is unknown, but it was probably similar to the Soviet OSOAVIAKhIM. An attractive badge featuring a horse rider, PPSh submachine-gun and rifle. In very fine to excellent condition. $260.00 Badge for 20th Anniversary of Victory at Khalkhin-Gol, 1959 issue. A very uncommon award in excellent condition. $975.00 Membership Badge of the Supreme Soviet (Great Assembly or Khural) of Mongolia, Type 1, #124, 1924-1944 issue. In superb condition - one of the best examples of this badge we have seen. Comes complete with mint marked screw plate. $140.00 Membership Badge of the Supreme Soviet of Mongolia, screw back, #0911, 1951-1960. Near mint condition. $195.00 Membership Badge of the Supreme Soviet (People's Khural) of Mongolia, 1970-1990, screw back version, #621. In Excellent condition and includes original screw plate. $180.00 Membership Badge of the Supreme Soviet of Mongolia, pin back, 1970-1990, #767. In excellent condition. $30.00 Badge of a Town Council Deputy, circa 1970s. In excellent condition. $120.00 Badge for 15th Anniversary of the Mongolian Revolution, 1936 issue. In very fine to excellent condition. $25.00 Medal (Honorary Badge) Commemorating the 50th Anniversary of the Mongolian People's Republic, 1974. Excellent condition. $25.00 Arkhangai Unen Newspaper 20th Anniversary Badge, circa 1950s-60s. In excellent condition. $40.00 Badge of an Outstanding Worker of the Selenge Province, circa 1960s-70s. Excellent condition. $10.00 Badge of a Shock Worker, circa 1970s. Excellent condition. $60.00 Winner of Socialist Competition badge, Type 1, #4716, circa 1960s. Impressive badge in outstanding condition. $40.00 Badge of Outstanding Worker of Public Service Sector, relief reverse variation. Excellent condition. $45.00 Badge of an Outstanding Service Industry Worker, circa 1950s- 60s. A relatively scarce badge in excellent condition. $20.00 Socialist Labor Brigade, large version, circa 1950s-60s. Excellent condition. $14.00 Socialist Labor Brigade, small version, circa 1950s-60s. Excellent condition. $50.00 Nairamdal Railroad, commemorative badge, early to mid 1950s. A scarce and unusual badge showing flags of three "brotherly" Communist countries: Soviet Union, Mongolia and Red China. Few years after it was instituted, the Chinese parted company with the others and the badge became "politically incorrect". $80.00 Honored Railway Employee Badge, circa early- to mid-1990s. In near mint condition. $210.00 Badge of Outstanding Animal Ranger, circa 1950s. Variation with turquoise sky. In very fine to excellent condition, far better than the average for this badge. Includes original maker marked screw plate. $295.00 Badge of Outstanding Animal Ranger, circa 1950s. Variation with sky of violet blue shade. In outstanding, excellent condition - probably the best example of the Mongolian Ranger badge we have ever seen. $110.00 Badge for Excellence in Livestock Farming, Type 2 Variation 2, #2985, circa 1940s-50s. An attractive piece in excellent condition. Includes original screw plate with Soviet mint logo. $50.00 Badge of Outstanding Worker of Agriculture, Ministry of Procurement, circa 1960s. In excellent condition. $45.00 Horse Racing Competition, award badge, circa 1940s-50s. Beautiful and scarce early piece in brass and top quality enamels. A quintessential Mongolian award in excellent condition! $20.00 Badge of a Participant of the Second Agricultural Conference, 1959. Attractive badge in brass and enamels featuring a Mongolian wrangler lassoing a wild horse. In excellent condition. $5.00 Mongolian Revolutionary Youth League (Communist Youth) membership badge, 1970s-80s. In brass. Excellent condition. $35.00 Badge of a Participant of the 1st Conference of Mongolian Young Pioneers, circa 1950s. Excellent condition. $40.00 Delegate's Badge of the 18th Congress of Mongolian Communist Youth. Very unusual large piece measuring approx. 2" by 1". In excellent condition. $20.00 Mongolian Revolutionary Youth League 50th Anniversary Badge, 1971. Soviet-made badge showing Leningrad Mint logo on the reverse. In excellent condition. $50.00 Mongolian Revolutionary Youth Outstanding Worker Medal, #420, circa 1980s-90s. Massive and well-made piece in excellent condition. $25.00 Mongolian Revolutionary Youth League Achievement Badge, circa 1980s-90s. $20.00 Mongolian Young Pioneers Badge for Excellent Grades, circa 1950s-60s. $45.00 First Festival of Mongolian Youth and Students, participant's badge, 1959. Very impressive early badge in excellent condition. $30.00 Second Festival of Mongolian Youth and Students, participant's badge, 1963. In excellent condition. $15.00 Mongolian Trade Union membership badge, #06224, circa 1950s-60s. Fine quality badge with a stamped serial number to the reverse. Excellent condition. $30.00 Badge of Outstanding Trade Union Activist, circa 1960s. Attractive badge in excellent condition. $40.00 Medal (Badge) Commemorating the 50th Anniversary of Mongolian Trade Unions, circa early to mid 1970s. An interesting piece with Soviet maker mark. The pin attachment has been repaired, otherwise in perfect condition. $20.00 Badge of a Participant of the 4th Conference of Mongolian Women, circa 1950s - 60s. Very fine condition. $35.00 Badge of State Sports Referee, circa 1950s-60s. In excellent condition. $25.00 First Spartakiada (Sports Tournament), participant's badge, circa 1950s. A nicely made badge in excellent condition. $10.00 State University graduate badge, 1970s-90s. Excellent condition. $15.00 Mongolian School Teacher's Badge, circa 1950s-60s. In excellent condition. $30.00 Badge in Commemoration of the 40th Anniversary of the School System of Khentii Province, 1970. In excellent condition. $20.00 Commemorative Badge of the Uvurkhangai Province, circa 1960s-70s. In excellent condition. $35.00 Participant or Award Badge of the "10 Days of Culture" Festival, circa 1950s-60s. Relatively large, impressive piece. $20.00 Badge in Commemoration of the 35th Anniversary of the Military Garment Factory, circa 1960s. In excellent condition. $25.00 Badge in Commemoration of the 40th Anniversary of Mongolian Publishing Industry, circa 1960s-70s. In excellent condition.